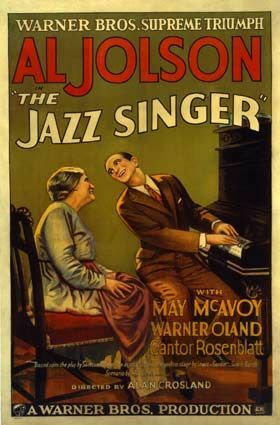 Based on a play entitled The Day of Atonement by Samson Raphaelson, The Jazz Singer is of extreme importance to the history of film because it was the first to feature synchronized dialogue with the film. This was accomplished through new Vitaphone sound-on-disc technology. Cantor Rabinowitz wants his son to carry on the Jewish family tradition and become a cantor at the poor Jewish synagogue on Manhattan’s Lower East Side. However, Jackie Rabinowitz (Al Jolson) is performing popular show tunes for a crowd. His father finds him and whips him. After, Jackie kisses his mother goodbye runs away from home. His father mourns at the yom kippur service that his son is not there to sing the sacred Kol Nidre song and that he now has no son. Years later Jackie becomes Jack Robin and the beautiful Mary Dale offers to help his budding career. Jack goes home but is banished by his father and his mother cries to find out he is a jazz singer. On the eve of his performance, Jack’s father falls ill and they ask Jack to be the cantor for the Yom Kippur service but Jack chooses his own performance and when his mother sees it she says, “Here he belongs. If God wanted him in His house, He would have kept him there. He’s not my boy anymore – he belongs to the whole world.” Jack decides to sing the hymns at the synagogue and please his father who forgives him with his last words. As time passes, Jack finds work again as a Jazz Singer and sitting in the front are both his mother and members of the synagogue. The film won a special Academy Award and was nominated for two others, including Best Screenplay and Engineering Effects. The Jazz Singer is a film worth watching purely for its claim to fame: the first film to be labeled a “talkie”. Without this novelty, the film would be, unfortunately, entirely forgettable.